Although I felt I had clearly covered the importance of state secondary education, Robert Smith still didn’t seem to have grasped it. Smith confirmed that his sister’s daughters had both recently attained degrees. One in media studies and the other in history. “Neither of them is working in their specialist field,” he finished, rather pointedly. Smith looked at me oddly. I cleared my throat noisily. Robert was grinning in an infuriating way. This was more like it. Surely this was a better example to illustrate the importance of state education. “Well I don’t think there’s any need to go into all of that.” I had the uncomfortable feeling that I was being set up for something. Smith had the air of someone about to prove a point. “Funny thing is…” Smith said slowly, drawing out each syllable. “He dropped out of school before his fifteenth birthday. Played truant – refused point blank to go. Never even sat an exam.” He smiled at me watching for my response. Eventually I became aware of someone tugging at my trouser leg. “Oh.. well sewing isn’t really my field…” I said. To my great alarm Miranda grasped my trouser leg and began tugging me in the direction of the door. 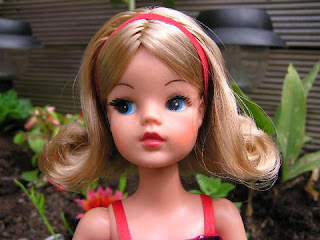 So it was that I found myself outside in the front garden a few moments later, observing a little tableau of dolls sat around the table from a Sindy playset. “Look, Dark Lord Badman,” said Miranda, picking up a doll. “This one is my favourite. She has lifelike hair that grows when you press a button. I think I may have recoiled slightly as the object was thrust toward me. I wrote down ‘lacks imagination’ on my form. Unfortunately that clashed with where I’d already written ‘over-active imagination’ earlier. I think that ably demonstrates the disturbed nature of home educated children. I was surprised. I imagine she must have had a lot of help, but had been primed not to say. Miranda gave me a puzzled look. “Hannah’s not a REAL rabbit.” Her hand suddenly flew to her mouth. “My Daddy said someone put a dead hamster in a lunchbox on our doorstep.” she exclaimed in a hushed voice. “Umm….. no….” I could hear my voice rising into that little squeak again. Miranda jumped up with a smile and raced indoors leaving me alone with the dollies tea party. Now I came to examine the dolls more closely, the costumes really did appear to be very good. Surely Miranda hadn’t made them all. I crouched down for a better look, finally sitting cross-legged on the lawn beside the tiny table. I picked up the nearest doll and made it walk across the grass, allowing myself a little chuckle. How ridiculous I must have looked. I picked up another doll in my other hand and walked it around to face the first one. “Hello, Mrs Doll. And how are you today.” I asked in a high-pitched dolly voice. “I’m fine, thank you Mrs Dolly. And how are you.” I answered myself using a slightly shriller voice for the second doll. I put the dolls together in one hand and brought them close to my face, looking for flaws in the seamstresses work. I turned one of the dolls upside down and turned its skirt inside out to peer for a label. Then I repeated the exercise with the other doll. I heard a strange strangled gasp behind me. I turned to face the road. In each hand I held a half naked dolly, their legs waving under my nose as I peered intently into their garments. I hadn’t heard the arrival of the Dial-A-Ride Hospital Transport service. The rear doors of the vehicle were open with ramps extending to the ground. There was a man at the bottom, ensuring the ramps were safe. Halfway down the ramp, guided by a volunteer orderly was a wheelchair. The wheelchair was occupied by old Mrs Mort! All three faces were turned in my direction, each one fixed with a frozen look of bewilderment and horror. Old Mrs Mort’s mouth was forming that familiar wobbly ‘O’ that usually precedes phenomenal screaming. I leapt up. The poor woman was only just returning from hospital following our previous encounter. “No! Wait! …. I’m not doing anything abnormal… I merely want to look up these dollies skirts!” I cried, waving them frantically in her direction. Old Mrs Mort somehow shoved her wheelchair operator out of the way. Gripping the wheels of the chair tightly, she reversed back up the ramp into the vehicle and slammed the doors. I must say she moved surprisingly quickly for someone resembling Davros in a hairnet. She refused to come out and eventually the Dial-A-Ride staff had no alternative but to return her to hospital. My wife informed me later that she appears to have suffered some kind of a relapse, so I doubt it’s actually anything to do with me at all. It may be some kind of agoraphobia I suppose. I do so look forward to these adventures. 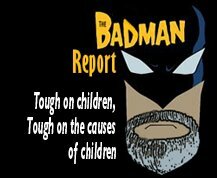 You should know that you now have a Canadian home-educating following, Dark Lord Badman. We think you're super. Keep on writing, I love coming back to read and bring a huge grin to my face.